Are you disgruntled about finding affordable housing in London? Are you on a zero-hour contract, working from hope to hope? Are you watching as social housing, the NHS and other social structures are demolished or handed over to profiteers? Are you wondering what our parks will look like after fracking? Or who will pay your pension? You might feel too insignificant to influence the course of events, disillusioned by a perceived two horse race or unrepresented. But imagine if we got all 5m youth to vote. Or the 15.9m people who didn’t last time. And then… imagine if we didn’t and had to accept the default option? If you are a tech head, a secret geek, a marketing genius, if you have ideas for activist campaigns, or want to offer and learn other skills to influence this election… Please join us for VOTEHACK. This weekend hackathon will design ways to encourage youth voting. It will help influence change through technology and marketing. It will be hosted by brilliant, skilled mentors, coaches and others that, together with you, will help make change a reality. We believe that we need a country full of active citizens. These are people that want to make a difference in society, that don’t want to be part of a country that perpetuates unfairness in any way, that thinks about inter-generational equity and will support structures that help all of us in our times of need. Exercising your right to vote is one simple way of saying ‘no’ to the status quo. Of not accepting that the current status and future trajectory are inevitable. Of believing and working toward a country you’re proud to live in. Its the most basic and first step towards active citizenship. Taking part in VOTEHACK allows you to learn how to use technology and marketing to influence the course of events. It’s a small attempt to support change. To encourage participation. To create ‘mosquitoes’ that can – despite their relative size and power – get heard. Come to VOTEHACK to help build solutions. 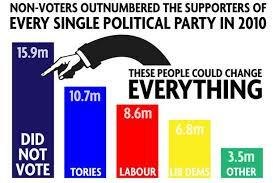 Register before 20th April to Vote. And do cast your vote on 6 May. We might take the right to vote for granted. But it wasn’t always so… In the UK suffragettes used lobbying, rallies, hunger strikes and faced imprisonment for demanding the right to vote. They had to pay taxes and abide by the law and believed they had an equal right to influence Parliament and government by voting. Switzerland only allowed women the vote in 1971 and Liechtenstein in 1984.